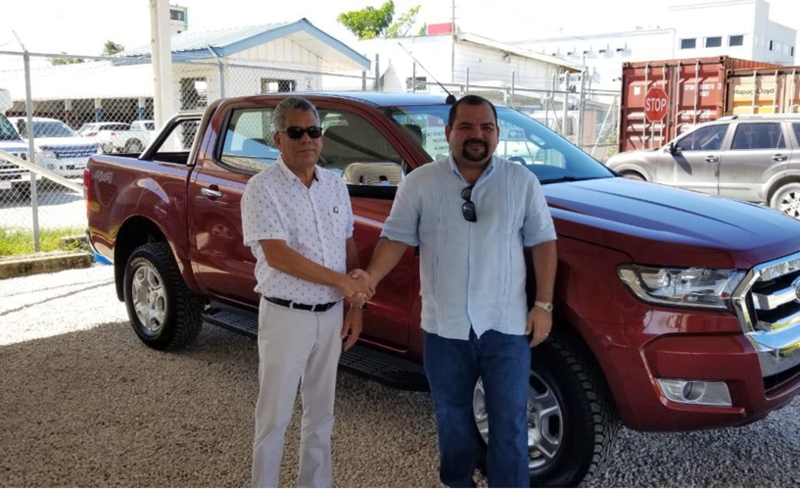 Mr. Robert Usher, In-coming President of the Rotary Club of Belize, hands over the keys to Jorge Recinos, winner of a spanking new Ford Ranger 4×4 won in Rotary’s raffle drawn on Sunday, June 17th 2018. His winning ticket was 0515. He was the holder of that lucky ticket of 1,000 tickets sold by Rotary Club of Belize members and their friends to persons all over the country. Minita Concha, a past Gift of Life recipient, picked the lucky ticket out of the barrel. The Rotary Club of Belize is involved in many projects during its Rotary year, which runs from July 1 – June 30th. Outgoing President, Mala Vasquez, extends a big thank you to all those persons who sold & purchased tickets and assisted in making this last of her year’s fund-raising efforts a great success. GIFT OF LIFE: Since 1977 the Rotary Cub of Belize has sent over 265 children to partnering hospitals in the USA for life saving heart surgery. We are very proud of this as a visiting nurse has pointed out that we are the only country that a Rotary Club is responsible for helping 100% of the country’s children with Congenital Heart Disease. BURN VICTIM MERCY FUND: This program was founded by one of our past presidents, Mrs. Yvette Burks Barnes. She continues today to coordinate all logistics to get burn victims to the Shriners Hospital in the USA. WHEELCHAIR PROJECT: Over the last 13 years with the help of North American Rotary Clubs, and the USA and Canadian Wheelchair Foundation we have distributed 2,200 wheelchairs countrywide. HOUSE BUILDING PROJECT: For the past 16 years we have been building homes for families in need. Recently we got a commitment from the Woodlands United Methodist in Houston, Texas to build 12 homes, two each year starting in 2017. Two have already been built. SCHOLARSHIPS AND SCHOOL GRANTS: Over 12 full scholarships and 6 tuition grants are given out annually. In 2016, we established an “Education Trust Fund to secure a sustainable scholarship program source. PRIMARY SCHOOL FEEDING PROGRAM: For the past 11 years the Rotary Club of Belize have been providing lunch for over 120 children at St. Joseph Primary School and Ebenezer Elementary School. PLAYGROUND PROJECT: Partnering with Emmanuel Foundation, Canadian Rotary Clubs, Interact Clubs and other Belize Rotary Clubs we have coordinated over 21 playgrounds for schools and communities in Belize. WASH: Water, Sanitation & Hygiene (WASH) is a project geared towards reducing the spread of preventable waterborne diseases. Recently a wash station and covered eating area was built for children at the R.C. Guadalupe Primary School in Sandhill and inaugurated earlier this month. We thank the public for its support of Rotary during the year.